January — well, December and January — have flown by so quickly, but I wanted to tell you all about CC's and my day trip to Mountain High Resort for tubing! 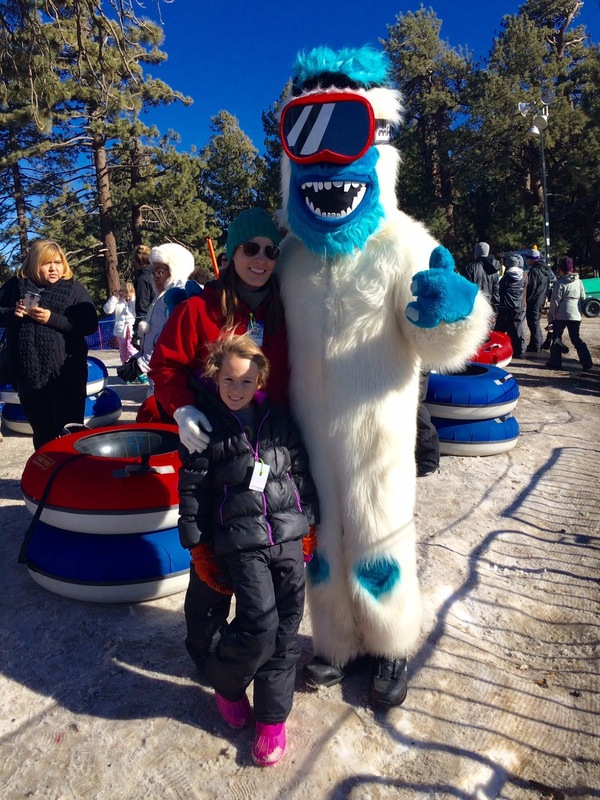 It was an early morning (and, truthfully, should have been earlier), but the tubing park is so easy to get to from Los Angeles that you have to try it at least once this winter. And don't worry. You still have time. While daily hours ended on January 3, the resort's North Pole Tubing Park is open Saturdays, Sundays and holidays through mid-March. As I said, we headed out early — 7:15 a.m. — on our two-hour drive up through the Valley and desert, then east to Mountain High. The tubing park opens at 8:30 a.m., but I thought we could get there just after 9 a.m. and still have plenty of time to go tubing. Well, just as a heads up, you should leave earlier. There are four sessions: 8:30 a.m.-10 a.m. ($20 adults; $15 kids); 10:15 a.m.-12:15 p.m. ($25 adults; $15 kids); 12:30 p.m.-2:30 p.m. ($25/$15); and 2:45 p.m.-4:45 p.m. ($25/$15). We arrived at about 9:15 a.m., and I was hoping to get tickets for the 10:15 session, but it was already sold out! There were so many people already there! We barely made it into the 12:30 session. So we hung out in the lodge and snacked on pizza and hot chocolate, moving outside by the pit fire when we wanted a chilly breeze. Keep in mind that families aren't allowed to play in the snow surrounding the tubing lodge — a liability issue — which bummed out more than a few kids, including my own. Once it was our time to hit the tubing slopes, we had so much fun sliding down one of the four tracks on sturdy tubes provided by the resort. There was even a "magic carpet" flat escalator that takes tubers and their tubes back up the hill, so you don't arrive breathless and panting once you reach the top. After we exhausted ourselves — and got a cute pic with the Mountain High yeti — we decided to head back home, catching a glimpse of the Mountain High ski slopes on the way. So if you're looking for a quick glimpse of the snow without making a real road-trip commitment, definitely visit Mountain High for tubing. We were home by dinner time! Ringing in the New Year at Noon! CC and Will make some noise at Discovery Cube Los Angeles! Who knew a New Year's party could be jam-packed at noon?! 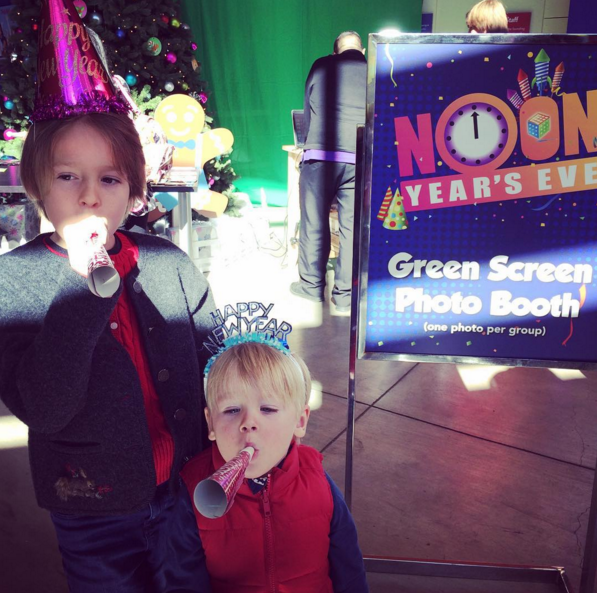 That's what happened last Thursday, Dec. 31 — aka, New Year's Eve, or Noon Year's Eve — at Discovery Cube Los Angeles. 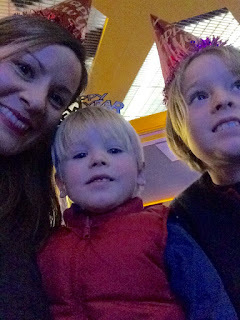 CC, Will and I walked into the children's museum to find families packed in tight to join in the hands-on festivities and watch balloons drop at 12 p.m. instead of the not-so-kid-friendly 12 a.m.
Moms, dads and kids dressed as various superheroes were greeted with complimentary New Year's party hats and noise makers and were invited to take a fun photo at the green screen photo booth. A DJ helps everyone rock out during the Noon Year's Eve party. While a cool DJ spun some pop tunes, including CC's latest favorite song ("Drag Me Down" by One Direction), families explored everything from the Curious George exhibit to the Santa Ana wind machine and the Science of Hockey. Not only that, but there were also special New Year's-themed exhibits on display. By far, CC and Will's favorite activity was the Alka-Seltzer rocket table. And the experiment was super-easy and something you can even do at home. CC and Will make rockets out of Alka-Seltzer tablets and water. The kids each received a plastic film container (not sure where you can get those in these digital days), but a little plastic tube with a cap would work. The activity director then poured a little water into the container, gave each child half of an Alka-Seltzer tablet and then asked them to place the cap on the tube and turn it upside down. In a matter of seconds, each tube popped into the air, sometimes about 7 or so feet high. You can guess why the kiddos kept going back to that table! And, of course, they loved the biggest highlight of all — the balloon drop and ginger ale toast at noon! Check out my Instagram video below of the fun! Tickets: $17.95 (adults); $12.95 (kids). Children ages 2 and under are free.